This fort is first mentioned in 1539 and measures 500 feet north to south x 400 feet east to west. There is little to be seen here as is the case for most forts west of Banna. A fortified church stands in the middle of the fort and is built entirely from Roman stone suggesting a lot of the foundations may have been robbed away. The fort name of Aballava means ‘Apple Orchard’ and the fort itself is now buried beneath the village of Burgh. Some inscriptions found do offer a little information on the garrisons here: 2nd century was the ‘ala I Tungrorum’, a mixed cavalry regiment of the First Cohort of Nerva’s own Germans some 1,000 strong came later. In the 3rd century a military cohort and a ‘cuneus’ of Frisians is attested and the last recorded troops were a ‘numerous’ of Aurelian Moors. The Notitia Dignitatum lists the latter as the sole garrison based here. Evidence exists of an earlier timber fort nearby and this could be dated to Trajanic or early Hadrianic periods. There is the possibility that this fort was associated to the Stanegate and was found from the air. It also lies over an earlier watchtower. 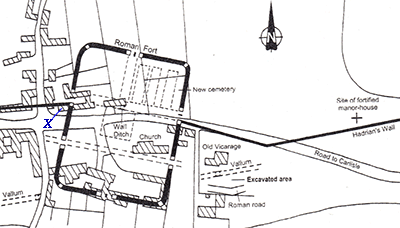 The Vallum, through excavation, may, as at Carrawburgh, run under the stone fort. The X on the map shows the position of the house whose owner gave me the opportunity to look into her cellar in order to identify any Roman stonework. Unfortunately the cellar of the house is just outside the fort grounds but the back garden lies over the north west gate entrance so no stone was identified. I was allowed to photograph the garden and that picture is shown here and may be of use in the future to historical experts, who knows. The copies of surveys and maps the owner gave me have proved invaluable and I will carry out further research on these. If any information is forthcoming I will post it on this page. Hadrian cohors quingenaria equitata / milliaria peditata ? 3rd_Century cohors I Nervana Germanorum milliaria equitata ?, numerus Maurorum Aurelianorum (253 - 8), † cuneus Frisionum Aballavensium (241) ? 1st_Note The numerus was under the charge of a tribune of a cohort in 253 - 8 and cohors I Nervana would fit best at this time. 2nd_Note Although the references to the cuneus come from Papcastle (RIB 882 - 3) the inscriptions seem to refer to a transfer of someone to the unit called cuneus Frisionum Aballavensium (the cavalry unit of Frisiones of Burgh) from an unnamed unit, presumably from the one in garrison at Papcastle to the unit at Burgh. 3rd_Note It seems difficult and unnecessary to assume that the cuneus had been moved to Papcastle and it is a well-attested Roman practice to set up inscriptions recording promotion on transfer at the post one is leaving. A cohors milliaria peditata is unlikely under Hadrian, as there are only two attested in the province and there was presumably at the time one at Housesteads and one at Bridoswald.